Fortune telling has become a huge fad in Japan. A young boy is watching a fortune telling show on TV which suggests you should visit the Demon Museum and recite an incantation to make the girl of your dreams fall in love with you. He heads there immediately and sure enough the girl of his dreams is there. He recites the incantation, but it frees a demon from its prison. The evil creature swaps bodies with the boy and escapes through time, leaving the boy in a dying demon body. 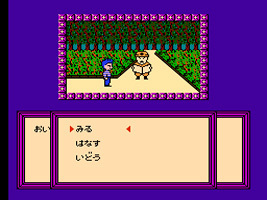 As the boy, you have to chase the demon through time using a time travel belt, swapping into different bodies. You control the action using a set of text-based menu commands, allowing you to talk to people and examine the environment.